This post is brought to you by Honey Bunches of Oats Breakfast Biscuits. All opinions are my own. One of my all-time favorite cereals- Honey Bunches of Oats- has escaped the bowl and now comes in handy on-the-go biscuits! New Honey Bunches of Oats Breakfast Biscuits are perfect for everyone from busy work-at-home-moms to chilled gamer kids. They’re made with 100% whole grain, so they give you the long-lasting energy of a bowl of cereal, but no bowl required. Honey Bunches of Oats was pretty much the first “grown-up” cereal that I ever ate. They always pack their cereals full of yummy bits and pieces of flavor-packed morsels to keep things interesting. I like my cereal like I like my ice-cream, with a whole lot of craziness going on. So I was a little concerned that they would have a hard time packing all that flavor into an on-the-go breakfast biscuit. I tried sticking them in a bowl, just for old time’s sake. They wanted nothing to do with that. As you can see, they banded together and escaped. Good thing each pouch comes with four biscuits, right? Just enough to form an escape team! They said “Nikki, don’t be ridiculous. We’re not meant to go in bowls!” Well, unless you top them with yummy yogurt, in which case, it’s totally acceptable. Sorry, my oblong friends. How do these little escape artists taste? Yummy, of course. They’re made by Honey Bunches of Oats, what else would you expect? The new Honey Bunches of Oats Breakfast Biscuits come in three delicious flavors: Honey Roasted, Strawberry and Chocolate Chip. Obviously, chocolate chip is my favorite. Chocolate anything is always my favorite! It’s perfect for dipping in coffee! Jacob, on the other hand, is more into the Honey Roasted. 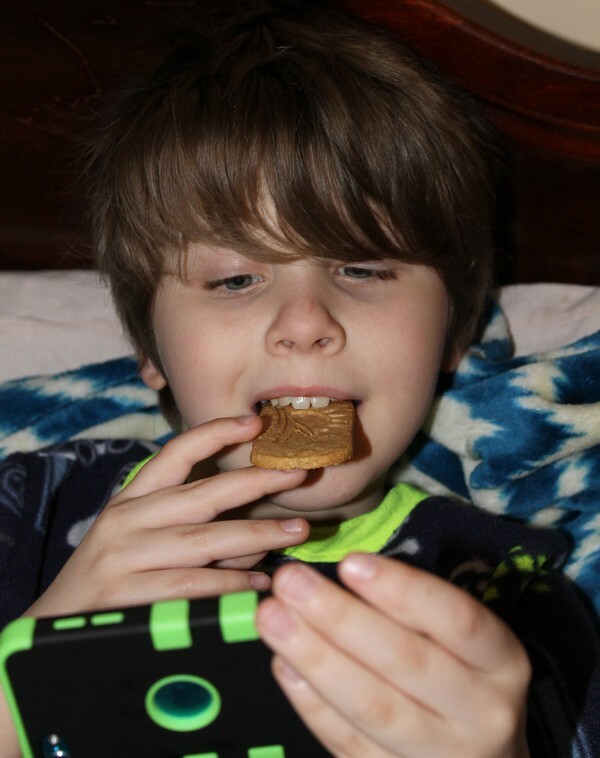 He likes the Breakfast Biscuits because he can eat them with one hand and keep on gaming with the other. Yes, by the way, I know it’s hair cut time again. His hair grows as fast as mine, which is pretty much as fast as Jack’s beanstalk sprouted. Another great thing about Honey Bunches of Oats Breakfast Biscuits: they’re perfect for school snacks. You’d think they’d get squished in a book bag, but they are actually pretty strong. I can tuck them in Jacob’s snack spot and they’re just fine when he’s ready for them. Since whole grain oat flour is the first ingredient, they’re allowed in his classroom (his teacher has a ban on snacks where sugar is the first ingredient). I love that I have another awesome Honey Bunches of Oats option in my pantry now. When I’m home and relaxing on the couch, I can reach for the bowl. When I need something fast, feel like a snack or just want something a little different, I now have my delicious Honey Bunches of Oats Breakfast Biscuits. 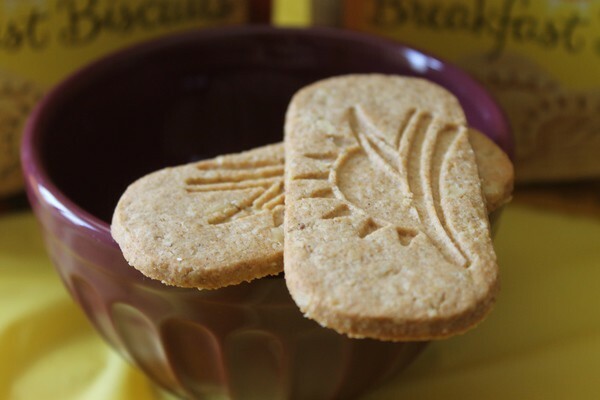 Have you tried new Honey Bunches of Oats Breakfast Biscuits yet? What flavor do you like best? I had NO idea that Honey Bunches of Oats had breakfast biscuits? What rock have I been living under? My son would love these! 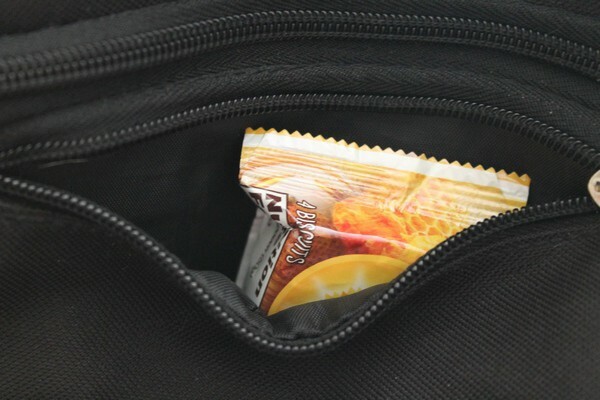 I like to keep quick grab and go snacks for my son and breakfast on the go options for when we oversleep and these would something he would totally love. Thanks! Those breakfast biscuits look tasty. I love honey bunches of oats so I’m sure I’d love these. I wouldn’t want to give up my cereal but these would be a great alternative when we are in a hurry. They would be a great choice to take while traveling as well. I wake up hungry and always have to wait for everyone to get ready to go eat. This would be great to dip in a hot coco or coffee. Yeah I am one of those dunkers lol. This biscuits looks tasty. I have never tried them before. I will look into this from the store to see if my kids will like it. Those biscuits look lovely and delicious. I love eating oats and given the choice to eat it conveniently while on the go makes me want to have more. Dipping the biscuits in either chocolate or coffee will improve the taste more. Yes, they are great as office and schools snacks. These biscuits look amazing!! I had no idea that Honey Bunches of Oats made a breakfast biscuit now!! I love things like this for when we travel it helps to keep my eating on track. Oh wow, I had no idea they made anything other than cereal. This would be a great morning snack for the kids. I am going to have to look for these the next time I go grocery shopping. Thanks for sharing, I had never heard of these before! I love honey bunches of oats, I can see both the kids and I enjoying this in the morning. Hmmm…these look like a really tasty product to try out – the Honey Roasted flavor is right up my alley. I would also like to try the Chocolate Chip. I haven’t tried these yet, but they also look like a good accompaniment for a morning cup of coffee. 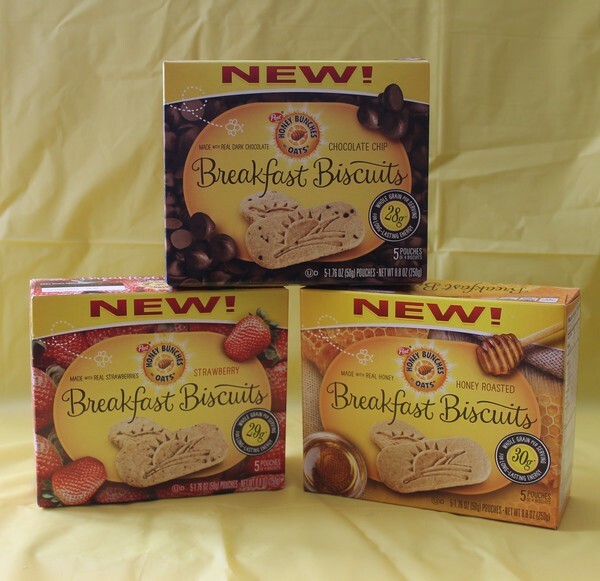 I have a lot of coupons to use on these New Breakfast biscuits and I am going to have to get me some and try them out. They look delicious! LOVE IT! These must be new, because I haven’t seen them in my local store yet. I love the Honey Bunches of Oats already, I’m forever eating their cereal! I will have to check these out. I’ve had breakfast biscuits like this before, but a different brand and they’re so yummy and easy, the kids love them on school day mornings. I eat right now in the morning & on the go are the BelVita bites or breakfast biscuits. I like their banana bread ones the best. They also have oats & chocolate, & mixed berry biscuits. They have soft breakfast biscuits which I like, because of my teeth. So I am excited about the new Honey Bunches of Oats Breakfast Biscuits. I like their cereal already. I am anxious to try their flavors Honey Roasted, Strawberry and Chocolate Chip. I know Honey Bunches of Oats give a few coupons in the newspapers now and then.